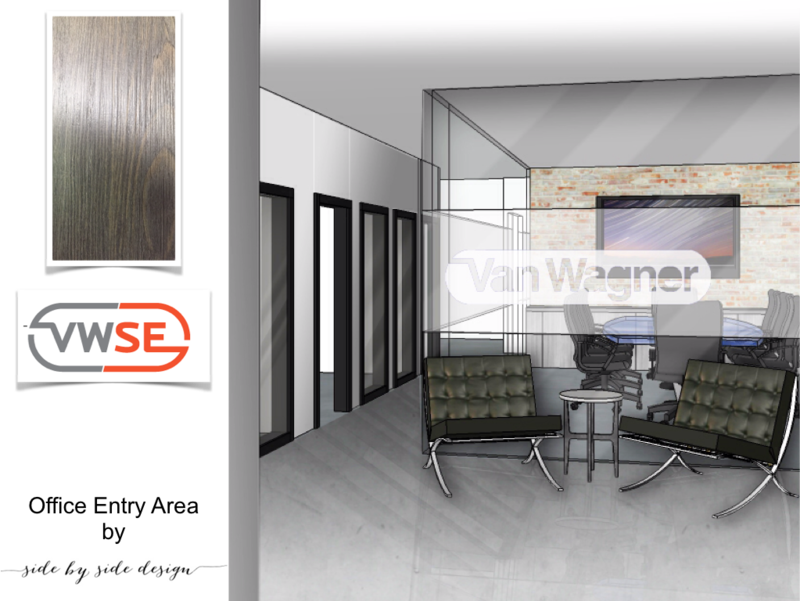 We recently had the opportunity to help with the design of the new office space for Van Wagner Sports and Entertainment. 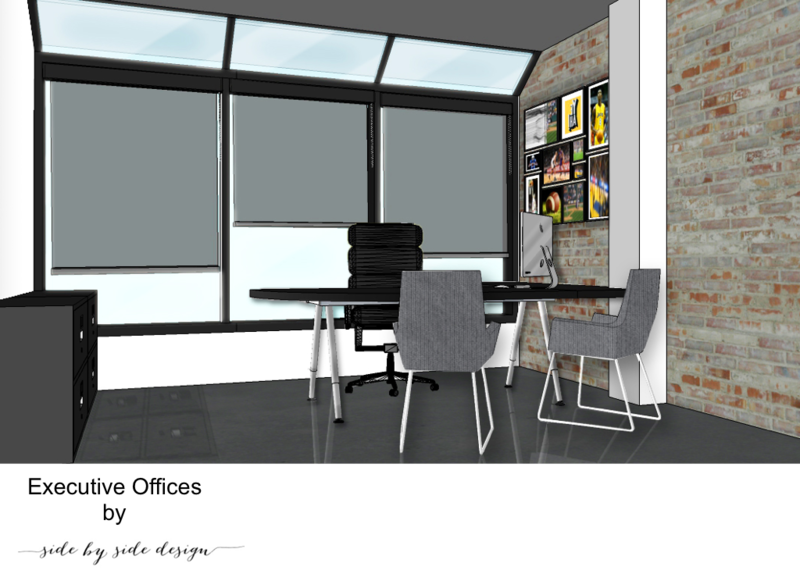 We thought it would be fun to show the process we went through with the design of the space as it was a different experience for us (considering our main focus is generally on residential design). 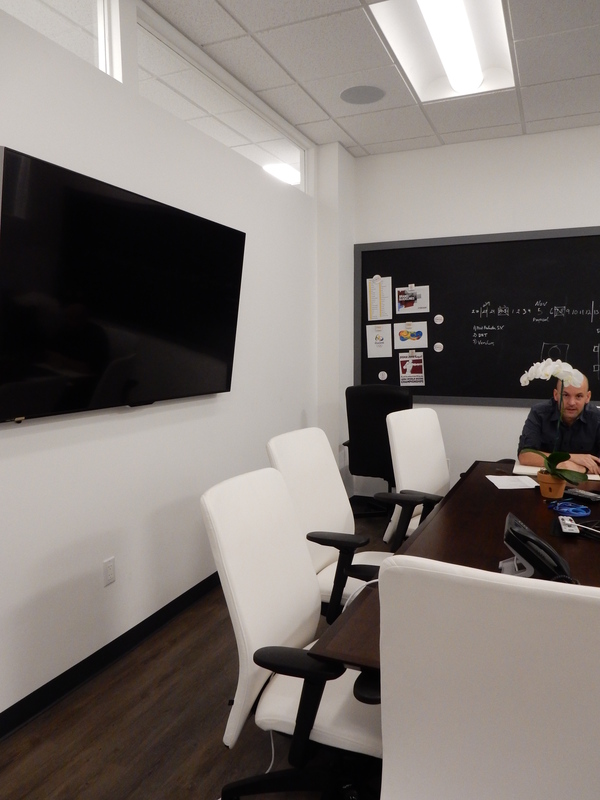 We started out the project in the existing space, discussing with the contractor what kind of structural changes would be made as well as the cosmetic changes. He provided Lauren with a floorplan of the new layout and explained that the new ceilings would need to be lowered to accommodate the new dry wall. They also planned to keep the rooms on the outer perimeter in tact but create many more work spaces to fill in the center area. 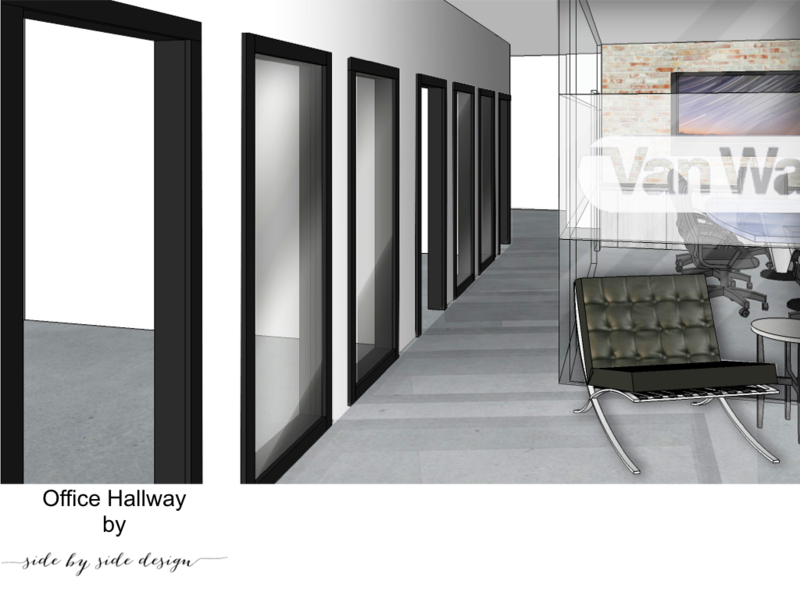 Lauren then created an overall design inspiration for this space giving the company the industrial and loft-like work environment they requested. 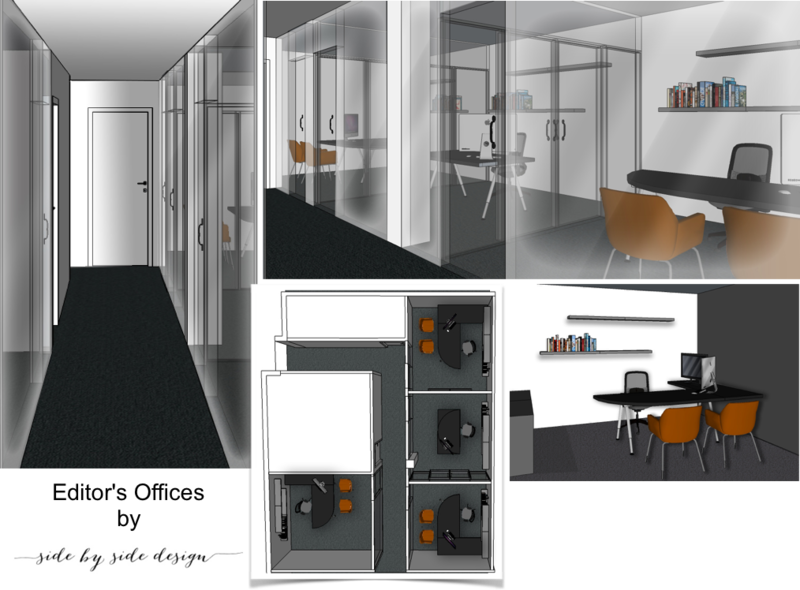 She worked with her renderer to create these drawings and show how the space would look when completed. As it is with most interior projects, there are many factors to consider before reaching the final design (one of which is budget). This did play a large part in the final design of the project. 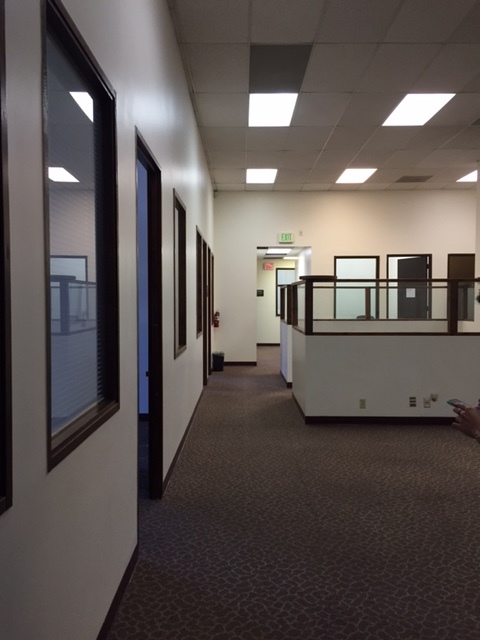 As you can see in the images above, the original plan included concrete floors, a glass enclosed conference room, and brick details. Although the finished product did not include any of these three elements, the overall structure remained the same and the finished product turned out quite beautiful. 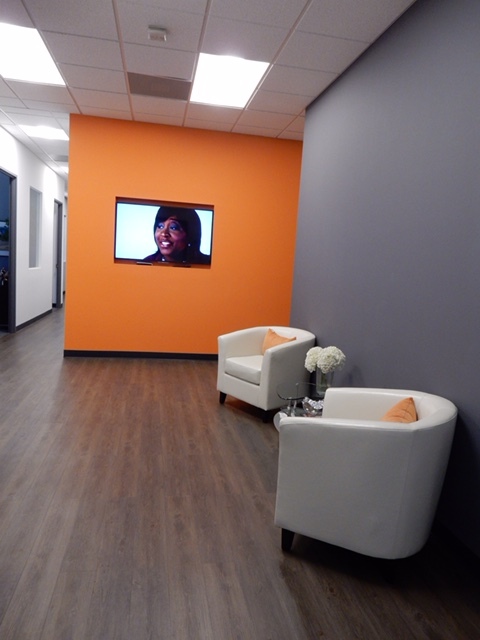 As we did not end up with the original glass walls, we opted to install the TV onto the focal wall instead and painted it the same orange as the company’s logo to create interest and a wow factor upon entry. 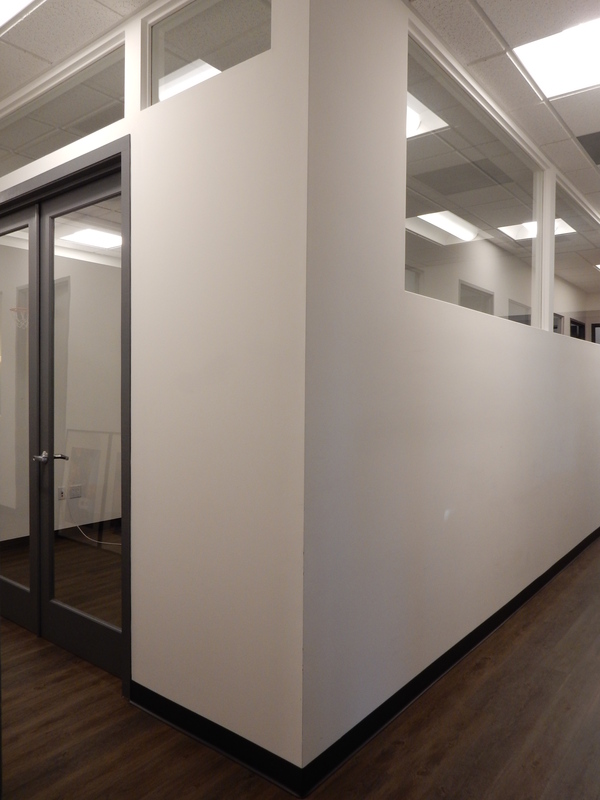 The adjacent wall was painted gray, also following in the direction of the company’s logo, and allowing the entry furniture to really pop. 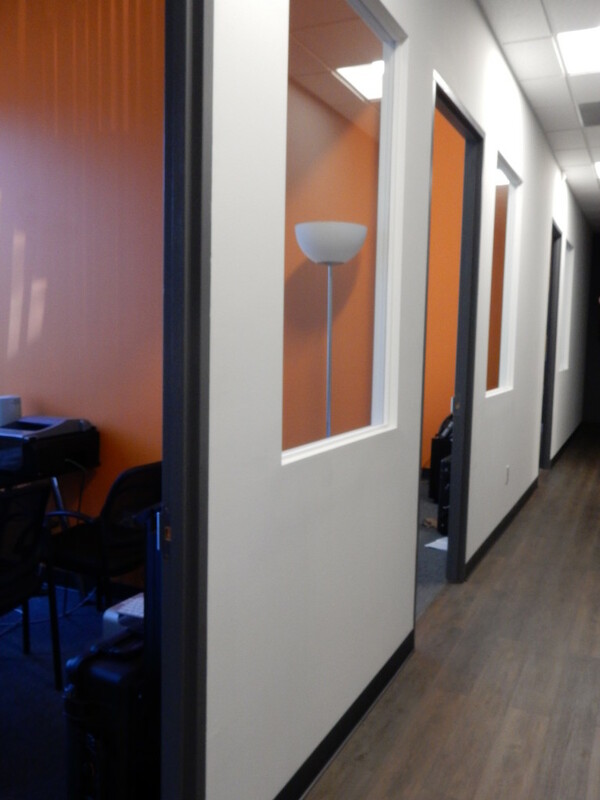 We used the same two colors for accent walls in the offices going down the hallway to keep with the same theme. 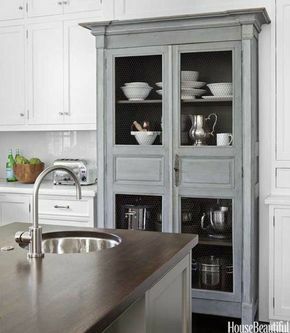 The rest of the materials were kept relatively simple; grayish wood floors and dark moldings and door frames for a crisp and clean look. 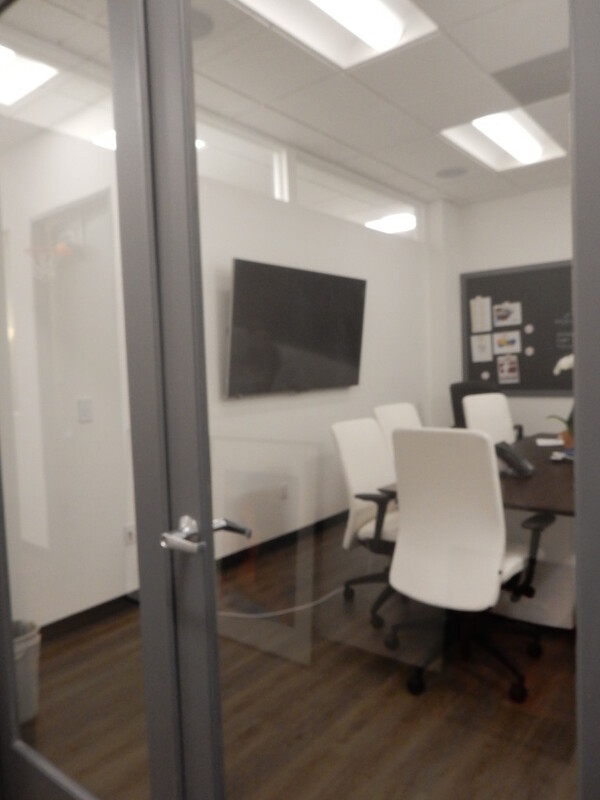 We included as many glass elements as we could into the conference room to allow for an open feel and kept the overall design modern and clean lined with a simple chalkboard wall and updated conference furniture. 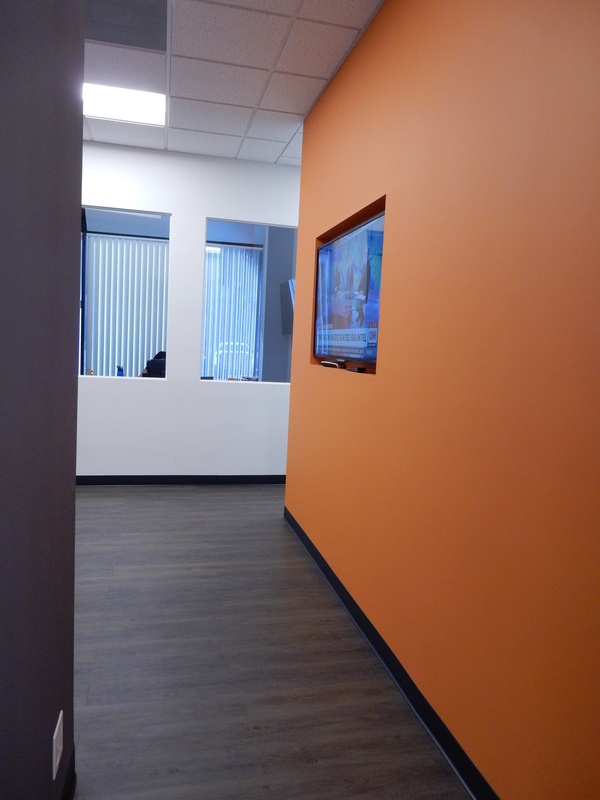 Overall, we are very happy with how this space turned out. 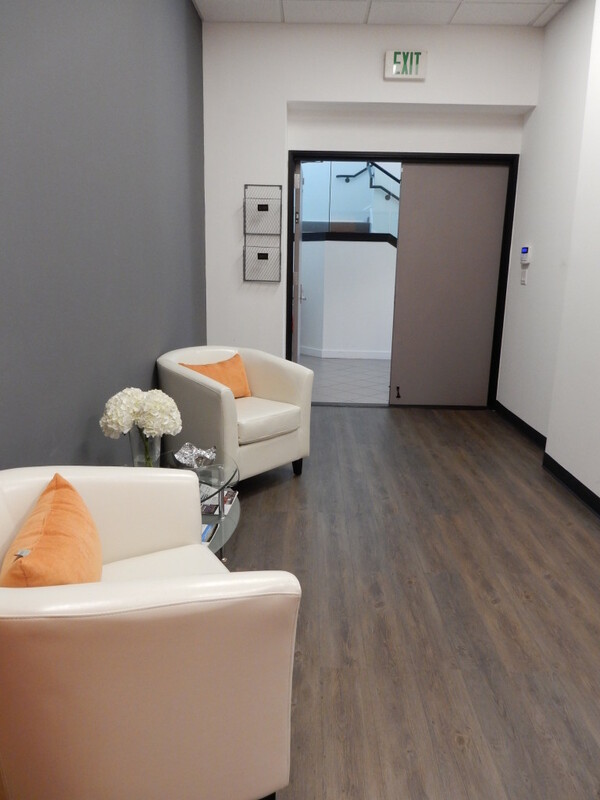 Our main focus in every project is to give our clients a place they are able to enjoy each and every day whether at home or at work. We take each challenge we are given in design very seriously and strive always to not let those challenges dictate the beauty of a finished product. It seems during the holidays, the kitchen is where all the magic happens! However, this kitchen is completely untouched this Thanksgiving, as the truly magical dinner is being prepared elsewhere. We use the look of your space (especially your dining room, as this is where the dinner takes place) to put the holiday inspiration together. 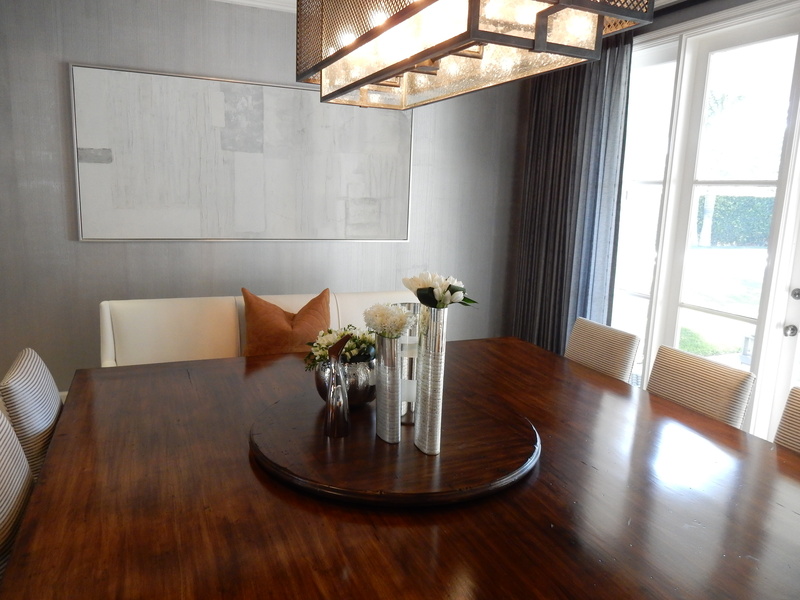 The design we came up with is intended to be casual and cozy and enhance the natural look of this dining area. Beautiful florals are a total perk in this special package deal. Our fabulous florist, Kayla of House of Magnolias, knows just the right blooms to include in your Thanksgiving table setting. Gorgeous flower arrangements will be found wherever your guests are; gathered around the dining table, lounging post turkey in the family room, and even in the closest powder bathroom to bring a festive touch. 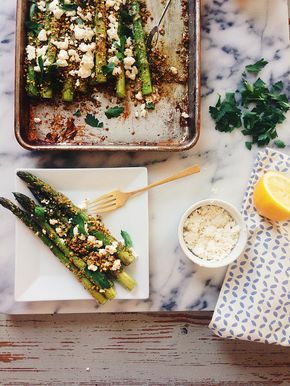 We all know that this holiday is all about the food, but that doesn’t mean that you have to spend all day slaving away in your kitchen. Cielo Catering and Events has prepared a fabulous suggested menu to please everyone’s taste buds. Delicious desserts are included too! 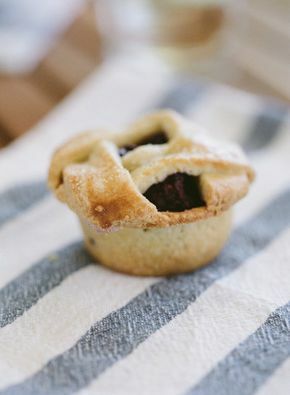 We can even package up leftovers for all of your guests to enjoy at home. 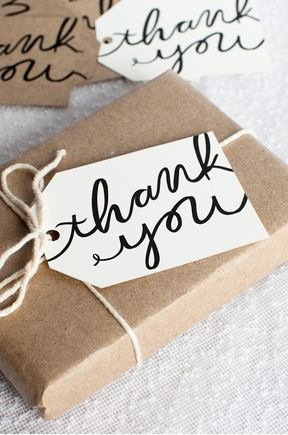 What a great way to say “thank you” for coming! For more information on any of the above services or to start planning for the next upcoming holidays, please contact us at info@sbsdesignla.com or call Tami Bitton, our Event Coordinator, at (480) 628-8264. #5: As seen in our post, It Feels Like Fall – A look at how we decorated for Thanksgiving three years ago. Lauren loves this “Give Thanks” plate she purchased from West Elm and takes advantage of every opportunity she can to use it in entertaining. To add to this festive display, we sprinkled some chocolates shaped like Fall leaves around the table along with other small gourds and mini pumpkins. 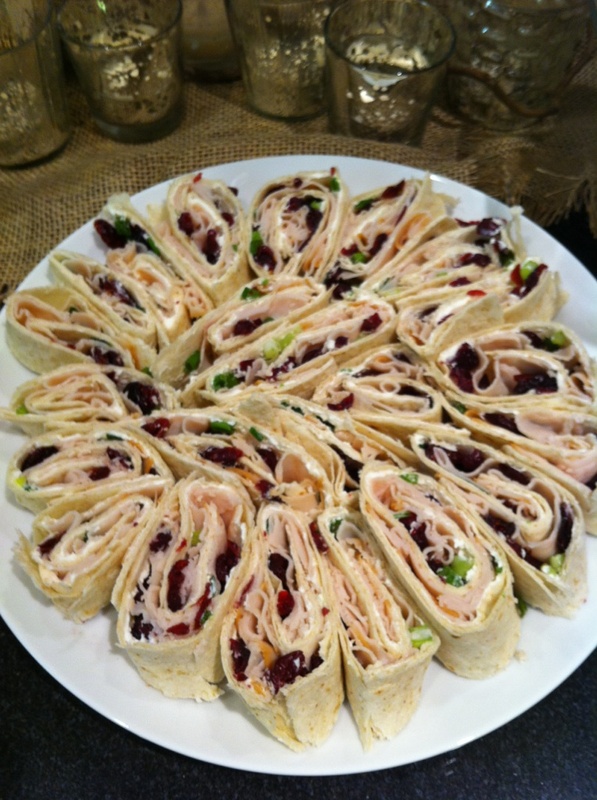 #4: As seen in our post, Cranberries Three Ways – We made these turkey cranberry wraps to enjoy at a Craft Club meeting we hosted three years ago. They were delicious and fit the theme of the meeting quite nicely as it was all about preparing for Thanksgiving. #3: As seen in our post, An Intimate Feast – This centerpiece cornucopia with pumpkins and gourds dressed up the table at our grandma’s Thanksgiving dinner quite nicely. Go Grandma! Your creativity made the top 5! #2: Also seen in our post, It Feels Like Fall – Another look at how we decorated for the season three years ago. Different shaped apothecary jars added height to this set up. When filled with burlap scraps and raffia they set the tone for a festive Fall display. We added an interesting pumpkin to one, a tall tapered candle, and straw colored licorice to give each jar its own unique flair. … and the #1 most pinned Thanksgiving pic: As seen in our post, Healthy Pregnancy Recipe Pumpkin Muffins – Ok, so we have to admit, this recipe was actually one Lauren made the last time she was pregnant but not during the month of November. It is a pumpkin recipe though so therefore to us it is Thanksgiving related. Don’t wait … use this link and make this recipe immediately! It is incredible and a very healthy way to get in the holiday spirit. As we have mentioned in many previous posts (including Boho Chic Engagement Shoot, Styled Vintage Tea Party, and Floral Tutorial by Kayla) we have been extremely lucky to work with floral expert Kayla of House of Magnolias. 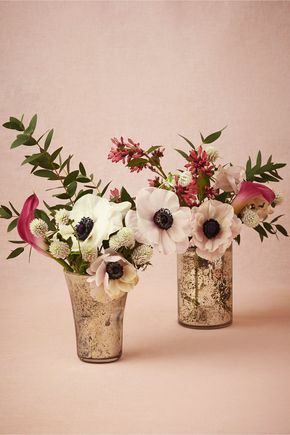 With each new project, she continues to amaze us with her open mindedness to new possibilities in the realm of floral arrangements and how she puts her own spin on things each time. 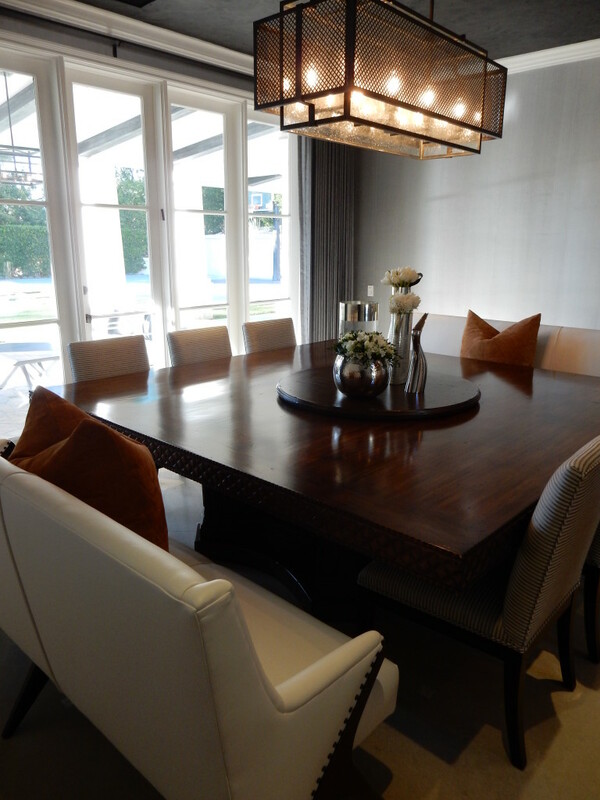 We are excited to welcome her back today to introduce our newest collaboration on the Interiors side of our business. 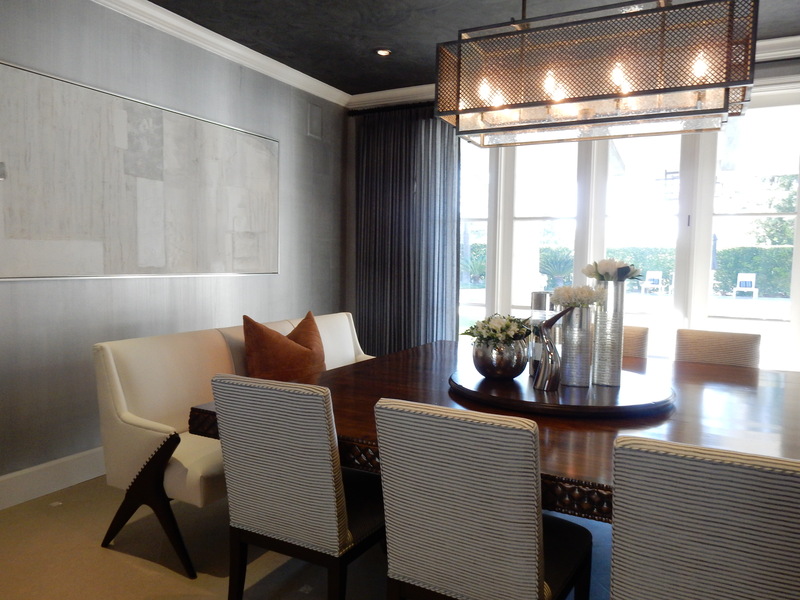 Recently, I had the pleasure of working with Side by Side Design on an Interior Design project. 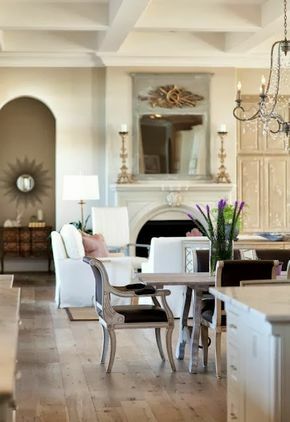 House of Magnolias provided in home floral design services for this stunning Transitional Edge Home (seen on Monday’s post). For this particular home, we went with an all white color palette. I chose flowers that were in season and long lasting. 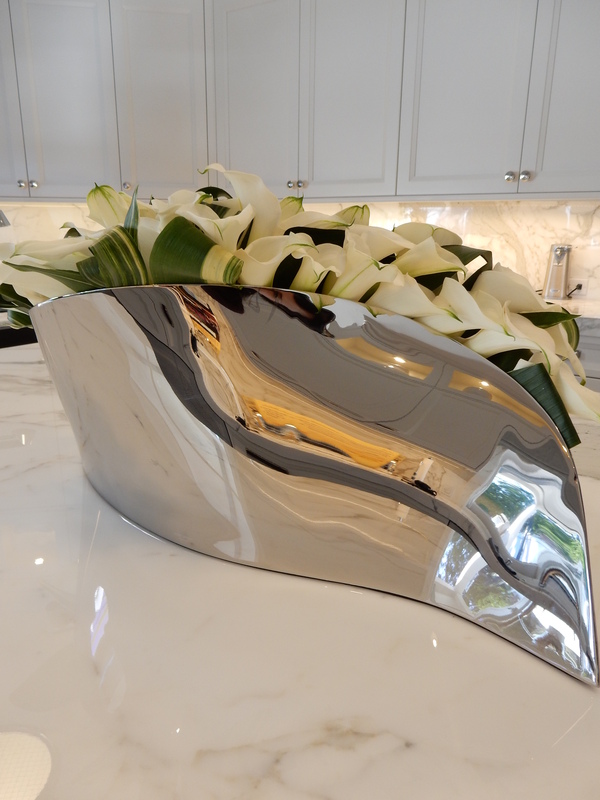 For the kitchen, I used all white calla lillies on a bed of ti leaves for a clean modern look. 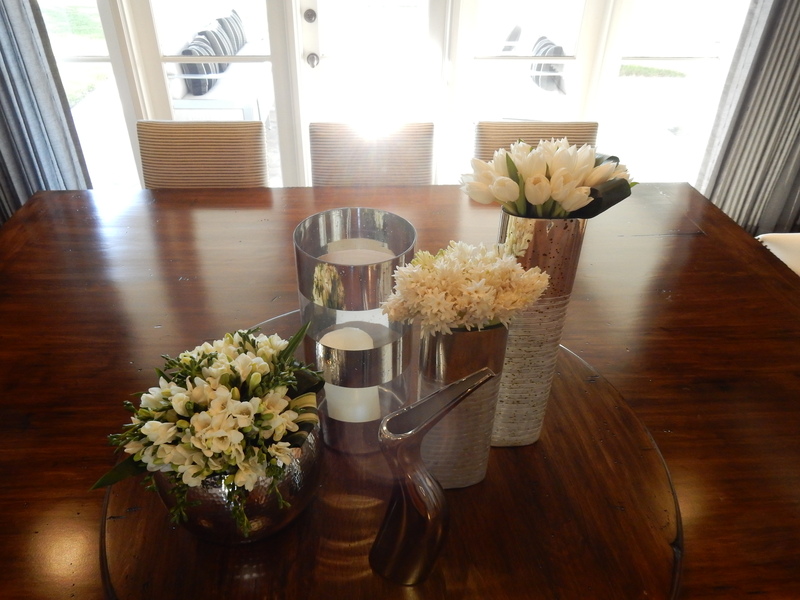 In the dining room, I chose a mass of white freesia in the silver bowl. 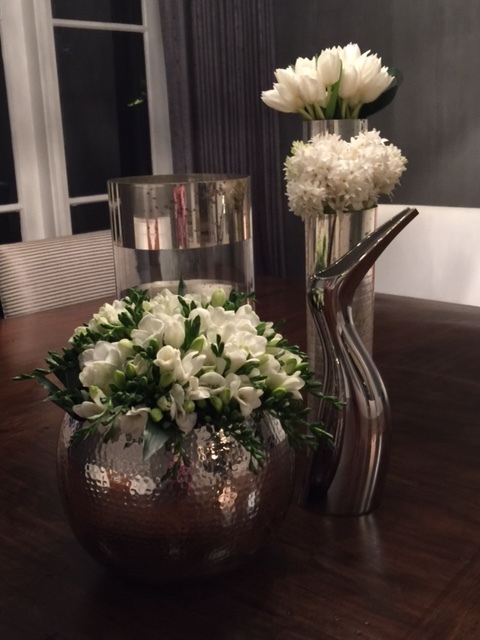 The freesia has many buds that should bloom and keep the dining room smelling lovely. In the taller containers, I chose hyacinth and tulips, keeping with the clean and modern look. 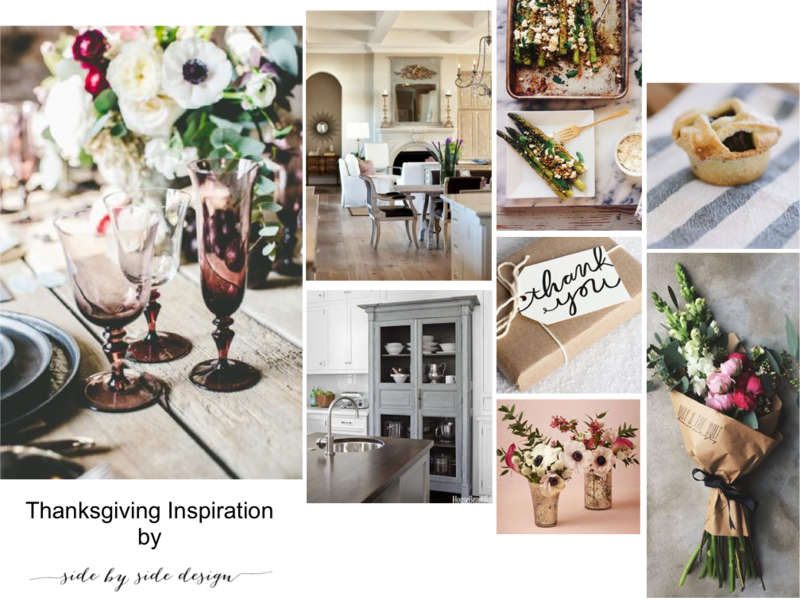 House of Magnolias is happy to partner with Side by Side Design to bring you home floral and plant services. 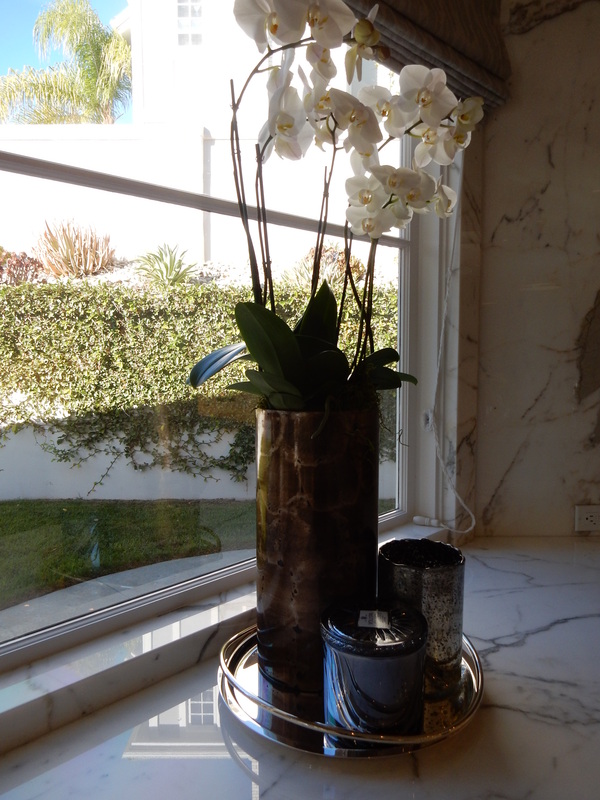 Most of my residential clients have reoccurring accounts where we refresh orchids and plants in their homes. We also do weekly fresh flowers for some of our clients. 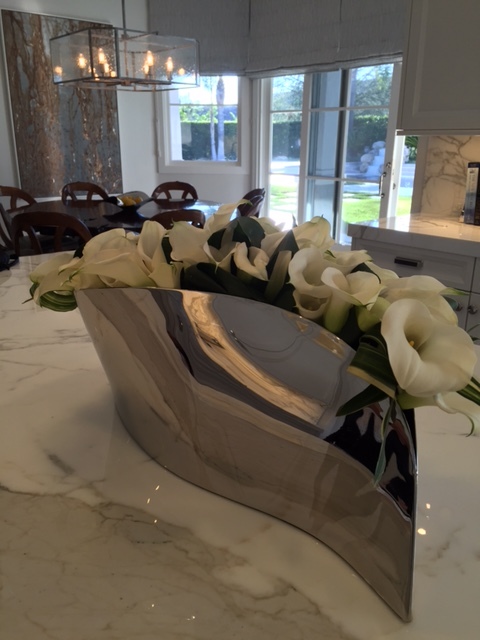 Contact Side by Side Design at info@sbsdesignla.com if you are interested in any of our home services. Although we have shown other spaces in this Transitional Edge Home (including the powder bathroom, kitchen, and teen bedroom), this is one of the first spaces Lauren started working on and has had a hand in every design decision from start to finish. It is truly one of her favorite rooms she has ever designed and you can see why. It’s unique, dramatic, edgy, and gorgeous. 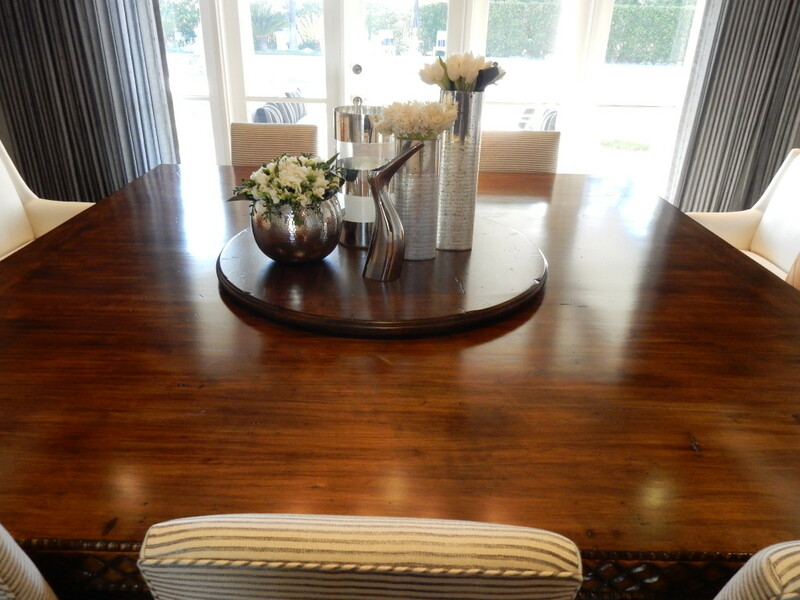 The existing furniture in this dining room was Tuscan in style and not in keeping with our new design. We decided to keep the table but completely modernize the seating. Our very talented dad (Jackie Bitton Fine Woodworking) built chairs for two of the sides with lower backs, simple legs, and a classic striped fabric and stark white leather benches for the other two sides with a mid-century modern leg for a unique twist. 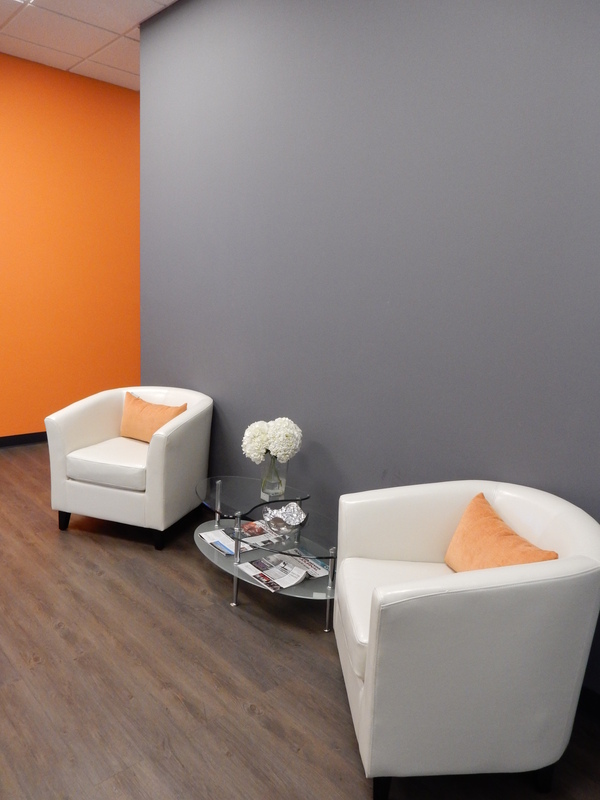 We kept all of the furniture low and simplistic so as not to overwhelm the space. 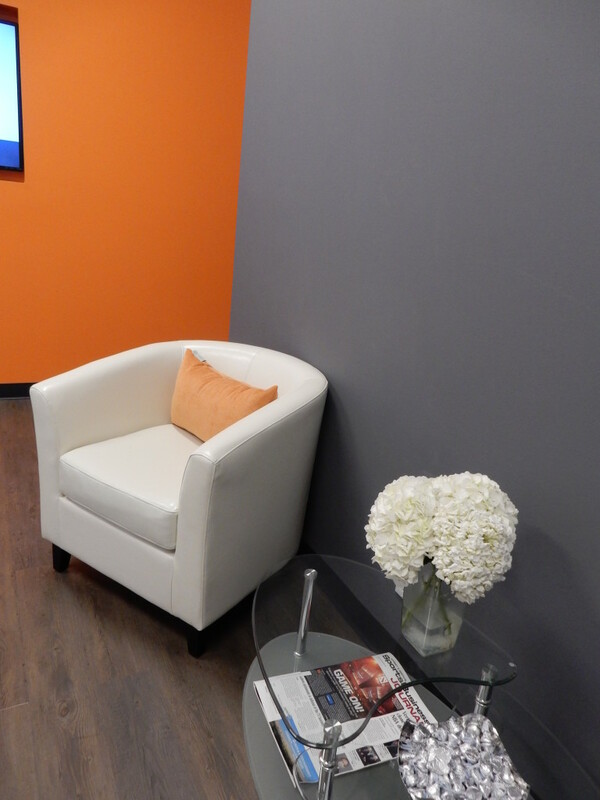 Our fabulous faux painter, Angel, created a textural wall treatment which is even more beautiful in person. It’s uneven, vertical stripes are painted silver. It has the most amazing highs and lows and can almost pass as wallpaper. 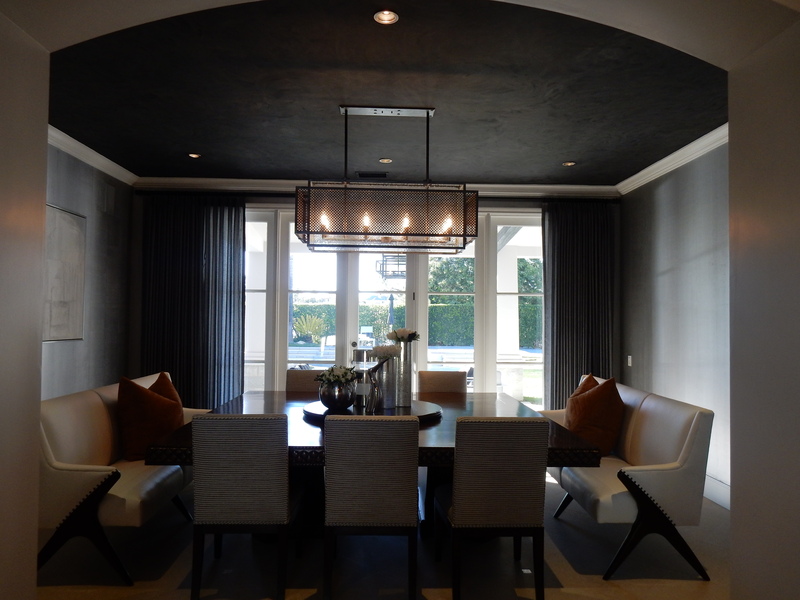 We decided to faux paint the ceiling as well in a dark finish to give the room the drama it deserves. When we were all done, we replaced all of the ceiling lights so that they cast just the right glow to show off these finishes properly and put in all new stainless steel recess cans for a modern touch. We wanted to keep the custom made draperies feeling not so heavy but still tailored. 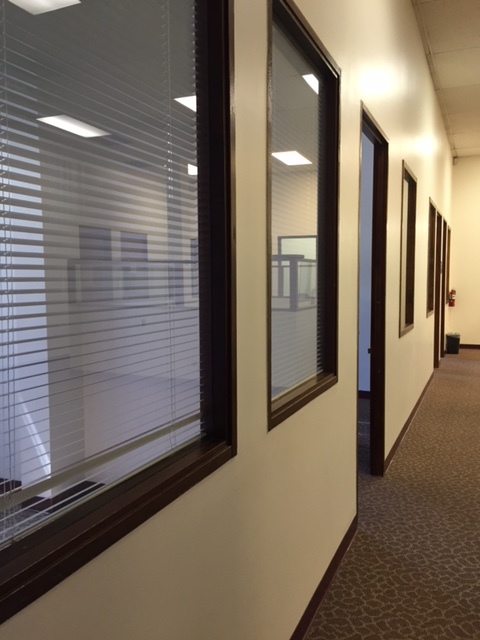 We opted to go for a sheer fabric in a similar color way to the walls with a striped linen texture. However, this room gets an exorbitant amount of light and can get very hot in the Summer months which created a challenge. We decided to line the draperies to help avoid this issue and went for a white lining option to showcase the texture of the fabric. 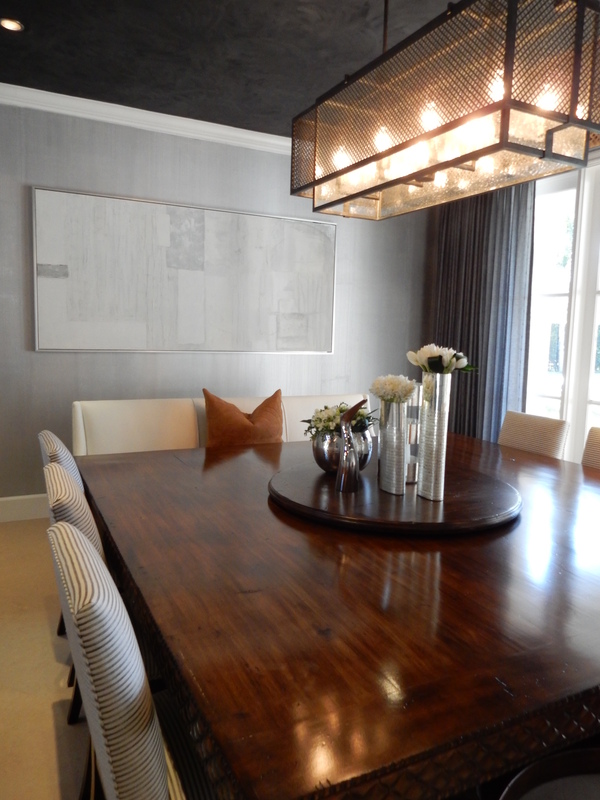 This light fixture, which was designed and created by Gali Art, makes for a very interesting focal point in the room. Lauren worked with Angel again to create this incredible piece of custom art. We just love how it turned out. More details on this service to come. 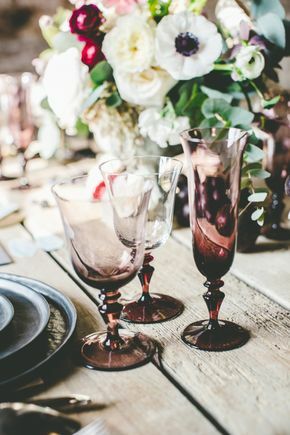 A room is never complete without the perfect accessories. Our client selected these pillows herself. 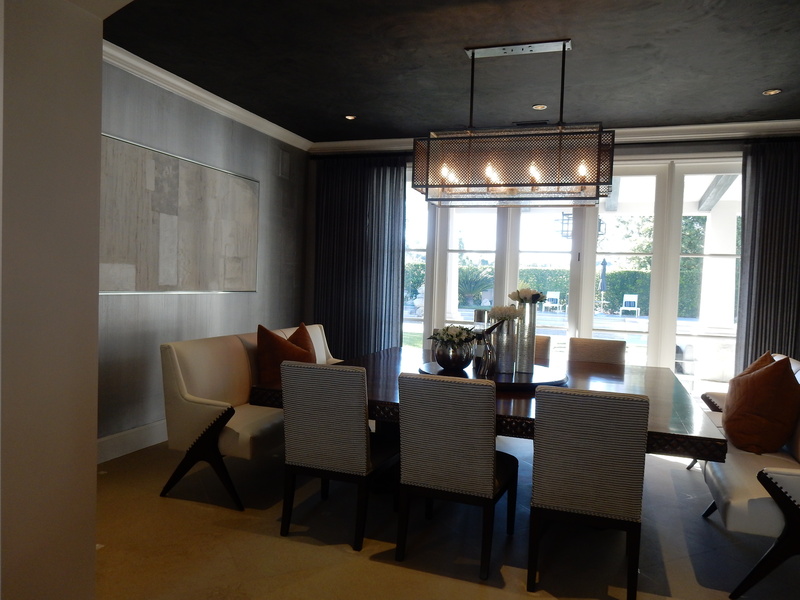 The color of the suede they are made from does a great job of tying in the warm elements from each adjacent room. 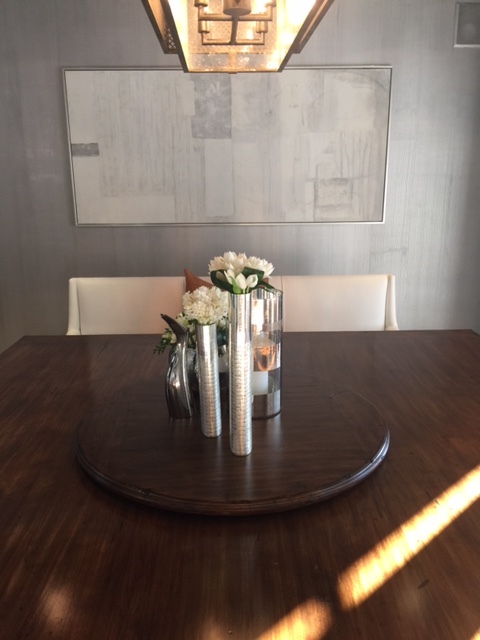 Lauren and her client hand picked each of these centerpiece items. They make for such an interesting cluster, and the different silver textures as well as the awesome shaped pitcher by Georg Jensen really helps to complete the space. 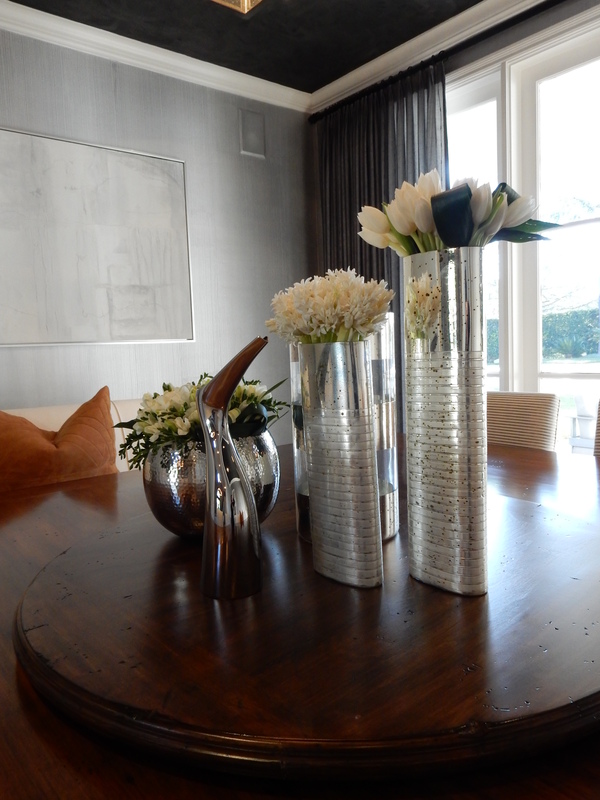 We had our amazing florist, Kayla of House of Magnolias, fill each of the vases with a modern arrangement. We can’t wait to share more about our new home floral service we are offering on Wednesday. We still have lots to share from this Transitional Edge Home. 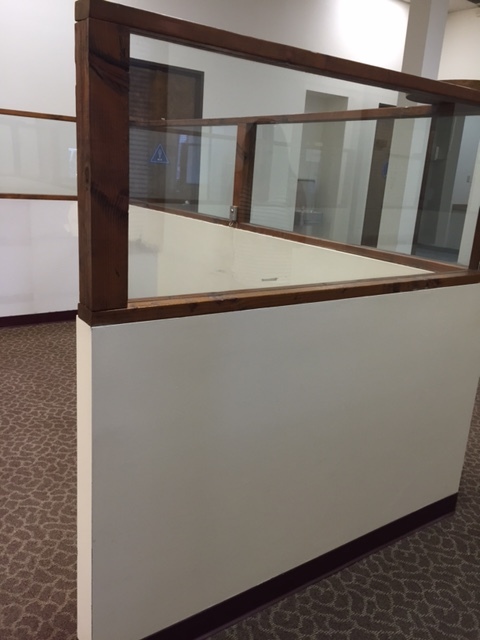 We are working away to complete each space, and can’t wait to share it all with all of you.